Again I’ve put some focus on the List Quick Helper which I think is a valuable extension on its on but also is a good platform for further extensibility. Extensibility not necessarily created by myself. With this update to the helper I’ve included two major additions to functionality. Ah! its Friday! And what better way to celebrate this day than with a nice GUI extension? With 2011, the GUI received a new breadcrumb control which is a very useful way to quickly orient yourself of where you are in the system and making it easy to climb up the specific hierarchy you’re currently drilling through. Of course, those of us who use Tridion know that we usually jump from one location to another, spanning over different publications and sections within publications. For those cases, if we want to go back to a location we were working on before we need to locate it again in the tree, which can be quite a hassle. Especially in large environments. So my extension will hopefully make it even simpler to work within the GUI in the manner I just specified. This extension adds 2 new buttons to the GUI right next to the breadcrumb. The buttons mimic the behavior of the browser keeping track of the places(folders, structure-groups, etc.) a user visits. 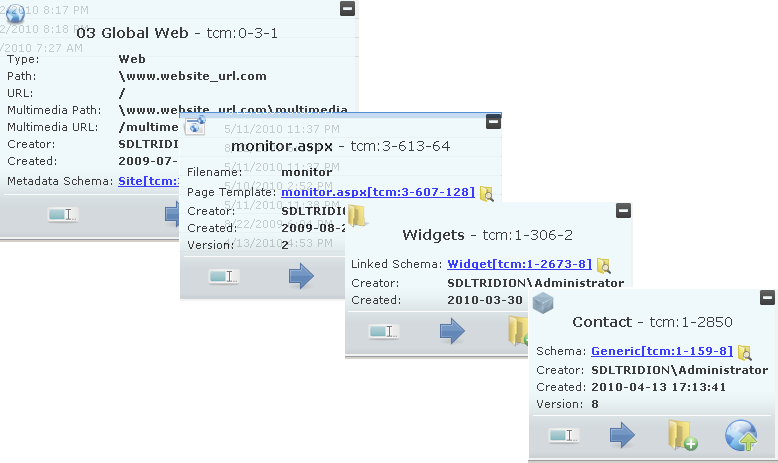 Since Tridion 2011 has been released with its shiny new GUI framework everyone and their sister have either been creating or thinking about creating extensions. I myself have been heavily involved in creating some. Traditionally, extensions for the most part are islands of functionality; code is typically hardly ever reused. This is something I’d like to improve. With the advancement of the Tridion framework and by following OO practices, it’s possible to create reusable code, frameworks and more, the sky it the limit really. 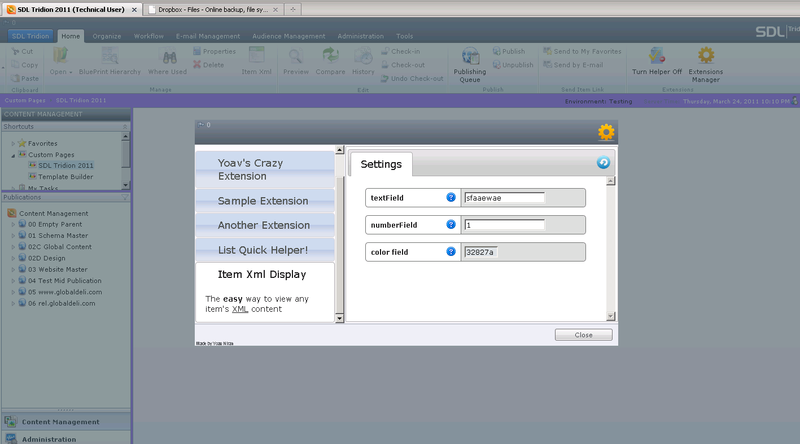 A few weeks ago I thought about customizing GUI extensions. As extensions mature it will make sense to allow Tridion users, whether administrators or business, the ability to make changes to extensions’ behavior, to turn functionalities on and off and more, without having to change the underlying code. This led to… *drumroll* … The Extensions Manager. While I have been planning to publish many more posts already this year, time seems more slippery than expected and I just can’t find it and hold it down for the necessary amount of… well, time. So nothing fancy with this post, I just wanted to publish the extensions I created before, for the Tridion 2011 CTP(Item Xml Display and List Quick Helper) with the update to make them work on the already released Tridion 2011 (GA).